If being thought generous is more important than being generous, if gaining a reputation for prayerfulness is more important to us than praying when no one but God is listening, if fasting is something in which we engage only if we can disingenuously talk about it, then these acts of piety become acts of impiety. The fundamental way to check out how sound we are in each of these areas is to perform these acts so quietly that none but God knows we are doing them. From D A Carson’s meditation on Matthew 6. While many of us are familiar with the stories contained in the first 11 chapters of Genesis, many of us may miss that a main goal of these chapters, particularly 3-11, is to show the spread of sin and its consequences from the Garden of Eden to the nations of the world. So while we can often retell the stories of Adam & Eve’s sin, Cain murdering Abel, Noah and the ark and the Tower of Babel, we might not know how they all fit together into a cohesive unit, setting the stage for what follows. Sin and evil spread. It spreads quickly, with the acceptance, and even the celebration, of evil happening soon after the Garden of Eden (see here on Genesis 4). Adam’s legacy of death is recorded in chapter 5, while the story of the flood (6-9) is not a cute bedtime tale for children but an account of punishment as a result of the unrelenting evil in the hearts of people. After that, while we see the spread of Noah’s descendants into the nations (Gen 10), we see it’s also partially a result of their sin in trying to ‘make a name for themselves’ (Gen 11). There is a dark cloud that hovers over the first 11 chapters. The call to be fruitful and multiply is partially fulfilled by the end of chapter 11, but evil, sin and death have multiplied with it. Given the severity of God’s response to Adam and Eve’s sin in Genesis 3, this shouldn’t be a surprise. But there are signs of hope sprinkled throughout these chapters, and I want to call attention to them. I’ll organize these in reference to Noah (Pre-Noah, Noah, Post-Noah), mainly because the Noah narrative takes up the largest amount of space in these chapters and has quite a few promises of God’s salvation despite the harsh judgment depicted. Even in chapter 4, immediately following the fall in the garden and the expulsion from Eden, we see that God still honors offerings given to him. Instead of God wiping Cain from the face of the earth after his horrific crime, God still protects the murderer, showing undeserved grace toward him. Noah’s appearance- and expression of hope at his birth- bridges us to the flood story, along with the salvation of Noah and his family. Noah is a bright light of hope in the midst of an evil world that rejects God. Noah’s obedience is specifically highlighted as God commanded him to build an ark. And in the middle of the flood narrative is this little gem, highlighting God’s grace in the midst of judgment. And he set the “rainbow in the clouds… whenever the rainbow appears in the clouds, I will see it and remember the everlasting covenant between God and all living creatures of every kind on the earth…” (9:12-17). So in the midst of the spread of sin, and the judgment of the flood, Noah and his family (even despite their own flaws, see chapter 9) stand as a ray of hope for mankind. But, the end of chapter 11 leads us up to Abram. While there’s not necessarily any sign of this being a positive turn of events up to this juncture, chapter 12 clearly functions as a turning point in the narrative: While the descendants of Noah have spread throughout the nations, and brought their evil inclinations with them, God has a plan to bless them all. After all, Abram is the one to whom God ‘announced the gospel beforehand’ (Galatians 3:8). But even before Abraham, there were rays of hope in the midst of darkness, teaching us that even though he kicked them out of Eden, God did not abandon his people in their sin and self-destruction. I recently preached a sermon as part of our series on advent last week. The audio is available here. This was special for me because it marks the first time I’ve officiated (right term?) the Lord’s Supper in our church. The audio is special because you get to hear my extremely talented friends sing a favorite song of mine at the end. In a few verses the writer is able to convey a sense of the catastrophic descent of the human race from covering up killing to boasting in bloodletting. Cain’s nonchalant words and his great-great grandson’s boast frame this genealogy and mark its spirit and its descent into a moral and spiritual abyss. The irresponsible ‘Am I my brother’s keeper?’ attempts to deny murder (Gen. 4:9); ‘I have killed a man for wounding me’ glories in it (Gen. 4:23). This is certainly not the dominion intended for humanity in Genesis 1-2. Moreover, the final compilers of the biblical text ensured that the text was to be understood as a unity. There are not only major groupings of books, but editorial ‘splices’ that join major groupings of books with each other. Therefore, both theological and literary points are made simultaneously. For example, at the beginning of each of the major sections of the Hebrew Bible there is an extraordinary emphasis on the word of God. The Bible begins with the word of God creating reality, and its first work is to create light, thus establishing the rhythm of the day and night (Gen. 1:3-5). The text proceeds to describe the first human beings and their residence in the garden of Eden, which is maintained only by organizing their lives around the word of God (Gen. 2:4-25). Joshua, which commences the second major grouping of biblical books, the Prophets, contains an exhortation requiring the new Israelite leader to meditate day and night on the Torah to ensure the success of Israel’s conquest of Canaan, and so be enabled to enjoy the fruits of the new Eden (Josh. 1:8-9). Near the beginning of the third and last grouping of books, the Writings, Israelites are urged to meditate on the Torah day and night in order to find success and become like trees planted in a garden alongside streams of gushing water (Ps. 1:2-3). By these links, this writing is conceptually distinguished from other writings, since it is the Word of God. But it is also distinguished literarily, since an implicit unity has been marked explicitly: it is also the Word of God. The two images above are billboards recently released by American Atheists. Should these billboards be considered persecution? I believe that they should. Denigrating one’s beliefs – especially in the callow, sensationalistic, straw-man manner shown on these billboards – counts as persecution, in my book. Granted, these billboards are not the equivalent of beating somebody and sending them prison, but are they not just a lower rung on the same ladder? It is promoting an environment where Mormons and Christians are ridiculed for their “unreasonable” beliefs. What would happen if these billboards really caught on, and the majority of society started treating Mormons and Christians with the same petulant contempt? Hence a series of ironies: American Atheists are against people being persecuted for their beliefs (e.g., “Action Alert” at the bottom of their home page), yet they persecute people for their beliefs. The billboards decry Christianity for promoting hate, yet they promote hate. The billboards violate American Atheists own aims and principles. It seems that even atheists have their share of people who break with their own by-laws. Christians have their share of people who advocate hatred, despite the fact that the book they purport to follow supports no such agenda. One of American Atheists self-stated aims is to “collect and disseminate information, data, and literature on all religions and promote a more thorough understanding of them,” a task at which these billboards miserably fail. I believe (hope?) that these billboards do not represent the majority of atheists in America. I’m hoping this type of rhetoric will be increasingly marginalized. From the responses I’ve read thus far on these billboards, it seems that most people are dismissing them, as they should. Conversely, I hope that atheists understand that churches like Westboro Baptist Church do not represent Christianity. Once again, it’s not organized religion that is the enemy, nor is it organized non-religion, nor theism, nor atheism. It’s people. We’re all hypocrites. We’re all inconsistent. We’re all hateful at some level. We are the great problem with the world, and we need a great savior. I maintain that reason is not this great savior, and I believe that history abundantly supports my claim. We cannot save ourselves. Only God can save us from ourselves, each other, and the mess we’ve made of this world. Through Christ and His Spirit, that’s exactly what He has done, is doing, and will do. Thanks to Zondervan for a review copy of this book and an opportunity to participate in the Blog Tour for Darrel Bock’s A Theology of Luke and Acts. A few weeks back Zondervan went on the look-out for bloggers who were interested in joining up on their Blog Tour for this fine book, A Theology of Luke and Acts. Who wouldn’t want to read something by Darrel Bock, right? 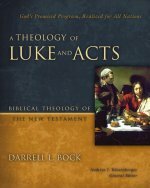 It makes sense, too, for Bock to be tabbed to write this particular volume, given that he has now completed commentaries on both Luke’s Gospel and Acts. Bock notes the cultural prejudice against women during Jesus’ time, specifically how they were not seen as reliable witnesses by society. Yet, they serve that function in Luke’s gospel time and time again, from Anna the prophetess to those who first receive the news of Jesus’ resurrection. They are some of his most loyal followers, often more faithful than the men who walked with him. Interestingly, the women of Luke’s gospel don’t fit a single mold. From rich (Joanna) to poor (the woman who gave her two mites), from righteous (Elizabeth and Mary, the mother of Jesus) to those with unrighteous pasts (the women who anoints Jesus’ feet)- Luke seems to take care to include the whole gamut of possibilities. Bock also correctly notes that individual women are not the main focus in Acts, since the focus of Acts tends more towards communities (through the ministry of individuals, of course). Key here is the inclusion of women in receiving the Spirit in Acts 2, responding positively to Paul’s teaching in Thessalonica, etc. Priscilla, wife of Aquila, is somewhat different, however, in that she’s not a recipient, but a teacher. As for the poor, it has been long said that Luke has great concern for them. Bock notes, correctly, that we can’t spiritualize these teachings, but must accept them for what they are: declarations that the poor will be blessed. He also notes that this concept is “rooted in OT texts… the pious poor of the Hebrew Scriptures who are exploited” (p355). Bock rejects the over-politicizing nature of liberation theology, remarking “What we have in these passages is something that falls between the full political agenda of a liberation perspective and the ignoring of the poor that often is the approach of the alternatives to liberation” (p355). I think he is basically correct here. While I’m not convinced it’s entirely possible to separate Jesus’ teachings from politics- especially not in Jesus’ day, when ‘separation of church and state would have been a completely foreign view- it’s hard to imagine that Jesus would call for the overthrow of a government in order to liberate the poor and oppressed (not to mention probably replace it with a new government that will form a new category of oppressed people). As solid as this chapter is, I felt like he came up one step short in explaining the importance for this aspect of Jesus’ ministry, especially how it relates to the Kingdom of God. In fact, the ‘Kingdom’ as a category seems to have received the short shrift from Bock in this volume. According to the subject index, it’s only discussed on about 10 of the 450 pages. Now, I realize the Kingdom of God is not peculiar to Luke’s writings, so perhaps Bock felt the need to focus elsewhere. Then again, healings, discipleship, Israel, the Hebrew Scriptures- these are crucial to all of the gospels yet receive their own chapters in this book. The point is that the ‘Kingdom’ is central to Jesus’ preaching, and we know this because it’s central to the Synoptic Gospels (elsewhere Bock calls it a ‘key theme’ [p141]). Jesus came proclaiming the Kingdom with his words, and demonstrating its arrival with his deeds. So what does Luke’s focus on women and the poor tell us about the Kingdom that Jesus proclaimed? This is where I was disappointed in Bock’s chapter. It’s not that he says anything wrong; in fact, there’s little to argue with in this chapter. It’s that he doesn’t say enough. He says basically what anyone with a little bit of time studying Luke-Acts can come up with. What he doesn’t do is connect the dots and tell us just why it’s so important Jesus’ ministry included reaching out to women and the poor, or why Luke in particular highlights this. Keep in mind that I’m focusing on one chapter out of 23. I highly recommend you go and read other reviews included in the Blog Tour to get a fuller picture of the book’s quality. From what I read (which was a little more than just this chapter), it seems like Bock makes solid observations, but may come up a tad short in pulling it all together and demonstrating the coherence of Luke’s theology. Welcome to the Bible: Chapters and Verses Bring Convenience and Challenges ~ Part 2 ~ Context Matters - Jean S Wilund on The Widow and Her Two Coins: Praise or Lament? I Can’t Believe It’s Not a Real Blog!